One of the most convenient ways to keep your sidewalks, porches, decks and steps safe is to purchase a high quality Ice Melt that will prevent ice from becoming a danger around your home. The best ice melt is safe for children and pets and can be used for residential applications. 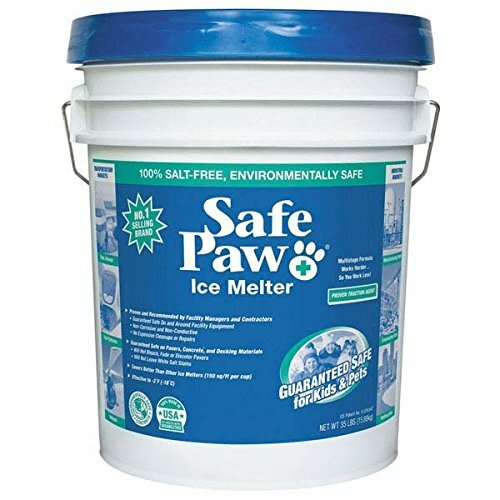 Our pick, Safe Paw Ice Melter 35 Lbs/Pail, can be used on steps, walkways, porches and decks without you having to worry unnecessarily about the pets or children coming into contact with the product. One of the things that go along with wintery weather is icy steps, walkways and decks. Although snow shoveling can get rid of the snow in these areas it is a good idea to do some planning ahead so you are prepared to handle the ice that can be very dangerous to those walking around on it. There are several things you need to know to ensure that you purchase the right Ice Melt for your needs. These considerations will help you sort through the different choices available and choose the one that is just right for your specific ice melting needs whether you are taking care of your home or you own a business and want to keep your customers safe. This guide will help give you a detailed look at Ice Melts so you will have all the information you need to find the right solution at an economic price. If you have pets and children at home you want to be very careful what kind of ice melt you purchase. Safe Paws Ice Melter is the perfect product for using around homes that have dogs and/or cats that are outside. These concentrated pellets can cover twice as much area as the traditional rock salt. It is pet friendly and will not irritate their sensitive skin and paw pads. This safe product works in temperatures that are as low as -2 degrees F.
It contains a time release formula that will help prevent any re-icing for up to three days after you lay it down. It is guaranteed to be non-toxic and safe for use around animals, vegetation, children, stone and brick. This 35 pound bag contains the active ingredients carbonyl diamide along with a glycol admixture. It comes in a safe, reusable hard plastic bucket with a tight-fitting lid. 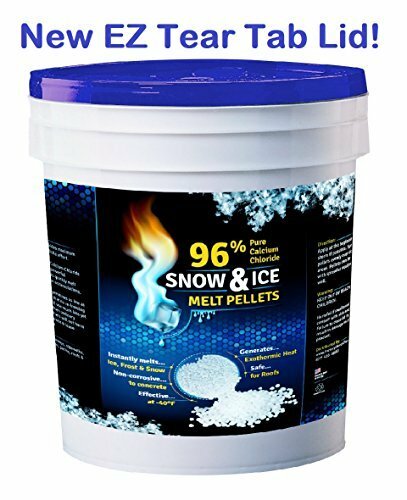 Maximize safety with little effort and purchase this 96% pure calcium chloride Ice Melt. It gets to work immediately upon application to melt snow, ice and frost. This product is safe for using on concrete (use as directed) and is non-corrosive. This ice melt is effective in temperatures as low as -40 degrees F. One of the benefits to this effective product is that you don’t have to use as much product as with other brands. It works by generating exothermic heat that will power through thick ice and snow. It is safe to use on roofs as well. This ice melt will melt ice 36 times faster than rock salt will. The use of this ice melter also ensures no re-freezing. Use these pellets on driveways, walkways, patios, roofs, parking lots, porches, steps and much more. This Snow and Ice melt can be used safely around trees, shrubs and lawns without harming it. It contains calcium chloride and can melt ice up to three times as fast as the competitors. The round shape of the crystals power through ice faster 3 times faster than the crystal or flat shaped melters. 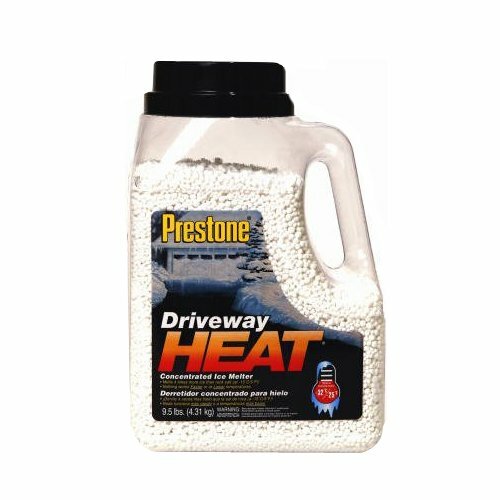 Prestone Ice Melt is safe for pets, children, vegetation and other items. It is designed with your pets in mind and have been designed to be safer for your pet’s paws without irritating them. This ice melter is safe for regular use on concrete and around automobiles. The easy apply shake container enables evenly spread ice melter over the area you are treating. You don’t have to worry about damage to animals or your belongings with this product. It is effective in temperatures as low as 0 degrees. The formulation in this ice melting product contains organic ingredients that reduce the damage to vehicles, metal and concrete significantly. If you know a bad snow storm is coming, pre-apply this great product and ice and snow won’t bond to the surfaces where you have applied it. The time released ingredients stay on the surfaces they are applied to longer than other products which lowers the freeze thaw cycle. Taking care of ice buildup is very important to the safety of yourself, your family and if you have a business, your customers. You have a choice of laying the ice melt down after there is ice on the sidewalks and steps or you can do some preventative measures and lay it down when the snow first starts so the ice and snow don’t attach. Whichever method you choose, there are many different quality ice melt products on the market that can help you take care of ice and snow where people will be walking. The three top rated ice melt products reviewed above are excellent choices. Two out of the three listed are listed as safe for children, pets, and surfaces. To learn more about ice melts and how to choose the best product for your needs, continue reading the buyer’s guide below. This information will provide the information you need to understand this product and how it works. It will also help you determine what your needs are and how to choose which product will meet your needs. There are a few things you want to consider before you purchase your ice melt product. We have listed these considerations below. What surfaces will you be treating? – do you have a driveway? Steps that get icy in the winter? Are your sidewalks a hazard in bad weather? Determine what areas you will using the ice melt on. Will areas beyond the areas with ice melt be affected? – You should pay attention to the areas outside of the areas you are using the ice melt on. Flower beds, ponds, etc that are close by can be affected by ice melt run off. See what you need to pay attention to. Be mindful of where the runoff will go – This is especially important if you have pets and children that could potentially play in the snow surrounding the sidewalks and driveways. Look for concrete friendly products – Some ice melt products can be very harsh on concrete and damage it. Get an ice melt product that is concrete friendly and that lists it won’t damage concrete and other surfaces. Match the ice melt to the region – Look for the right product that matches the weather you are having. Some products are better suited to large snow storms, ice storms, etc. There are several different types of products that are considered ice melt products. We have listed these products below with characteristics of each. Look over the different choices to see which one or ones fit your needs the best. Rock Salt – The technical name for rock salt is Halite. This is a mineral form of sodium chloride. When rock salt is put on the ice, it forms a brine substance when it starts to melt. Brine is a combination of salt and water. Brine’s freezing point is lower than that of water and that causes the ice to melt. If you are not in a region with extremely low temperatures (higher than 25 degrees F) rock salt is a very good choice. If you need an ice melt product that is safe for concrete, you should look for another product besides rock salt as this can damage concrete surfaces. Calcium Chloride Pellets – This de-icer melts ice quickly after application and is still effective at extremely low temperatures of as low as -24 degrees below zero. This ice melt releases heat which speeds up the melting process right away. This ice melt is actually good for your plants and is considered a nutrient for them. Because of this benefit, using calcium chloride is better than using rock salt. Calcium Magnesium Acetate – This product is environmentally friendly and is non-corrosive, safe for plants and water sources in the non-concentrated form and is biodegradable too. If your temperatures get down in the 20 degrees F range this is the product for you. It is safe for use on steps, pavers and sidewalks. Don’t think the sun will take care of the ice alone. Icy steps, walkways and driveways can be very dangerous and cause really nasty falls. Using a good quality ice melt helps to protect walkers from injury. Don’t Use too much ice melt. Using more than the recommended amount does not improve the performance. Stick to the instructions on the container. Apply it correctly – Always read the instructions on the bag or bucket of ice melt. Reapplying it is a good maintenance step if you apply it before it snows. Use the right kind of ice melt for the best results. The temperature that it melts to is an important number to know. If it gets colder than the bag says it can remain effective it won’t help the icy surfaces at all. Not having ice build up on your boots and shoes is a benefit to using ice melt. There won’t be ice and snow on your footwear to track in. Don’t use ice melt on brand new concrete or concrete that is less than a year old. It is very important that you know exactly what type of ice melt to use around your home and surrounding areas like sidewalks and decks. Using the wrong kind can cause certain consequences. We have listed them below. Stone floors can get scratched and require repair. Concrete can become pitted and need fixing. Ice melt can have dangerous chemicals in it if it is not listed on the container as safe for pets and children. It is very important that you know how to use it when you have children and pets around. We have provided some tips below that will help you use the ice melt safely around your family and keep everyone safe including your pets. Consider colored ice melt so you can easily identify treated areas and show your child where not to go. Never leave children outside unattended around areas that have been treated. Ice melt can be a help in keeping you and your family safe during the winter months when things can get really icy and hazardous to walk on. It works quickly and efficiently and prevents re-freezing. With all of the different brands and choices available you can find an ice melt product that will be perfect for your specific ice melting needs and circumstances. The top rated ice melt products featured above are good quality, reputable products that get the job done quickly. They are cost effective and two of the three choices are great for those who are using ice melt around their homes that have children and pets present. Ice melt is not hard to use but you have to be responsible so everyone remains safe. Read the directions on the container and follow it to the letter. It will do a great job getting rid of the hazardous ice on your steps, porch, deck, walkway, and driveway.